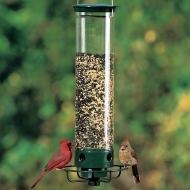 Experience the wonder of wild birds with the Stokes Select® Ranch Hopper Feeder! 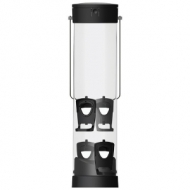 The Ranch Hopper is a great starter feeder, with a large opening for easy filling & convenient cleaning. 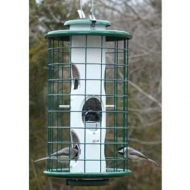 Its wrap-around perching tray provides plenty of space for multiple birds to feed simultaneously and its 1.7 lb. seed capacity hopper keeps hungry birds happy and coming back for more! The Stokes Select® Double Suet Feeder with Weather Guard is the perfect way to offer healthy treats to Woodpeckers, Nuthatches, Chickadees and more! 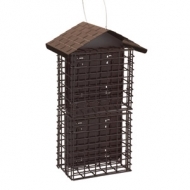 The cage holds 2 suet cakes and features an easy-open, double-locking closure system. Its brightly-colored roof design diverts rain & snow, helping keep suet cakes dry. 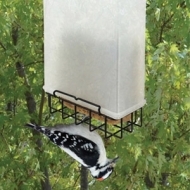 The Songbird Essentials® Suet Saver Feeder allows chickadees, nuthatches, and woodpeckers to feed upside down while keeping starlings and other large birds out. The plastic top keeps suet or seed cake drier than open suet and seed cake cages and includes wire cover and chain for easy hanging. 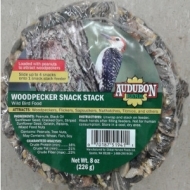 The Stokes Select® Four Cake Suet Buffet with Weather Guard is the perfect way to offer healthy treats to Woodpeckers, Nuthatches, Chickadees and more! 4 independent cages hold 1 suet cake each, providing more feeding space for clinging birds. 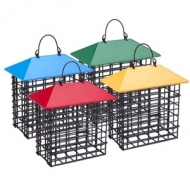 Audubon® Double Suet Metal Feeders are colored metal suet cages with Weather Shield top - a fun way to feed the birds. Ready to hang and easy to fill and clean. They come in three colors and hold two suet cakes. 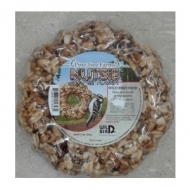 Appeals to all tree-clinging birds (nuthatch, woodpeckers) allowing you to treat your backyard birds to their favorite suet. 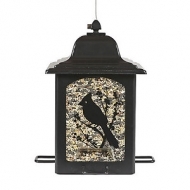 Fully assembled, included metal hook extends through the roof for easy placement on a tree branch or outdoor supports. Made in the USA. Keeps squirrels out! 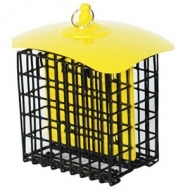 Caged Feeder, fill with black oil sunflower seed or peanuts. 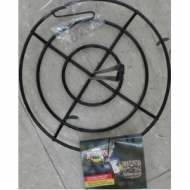 Vinyl coated wire cage stops squirrels from raiding your feeder. Most songbirds have access to seed but larger starlings, grackles, and jays can't get through the cage. Features a metal top and bottom seed saver tray. 8-in. diameter cage. PVC tube construction with metal ports prevents chewing. Metal top and bottom also prevent squirrel damage. The Yankee Tipper’s 9″ diameter weight-sensitive feeding tray attracts ground feeding birds, but tips under the weight of a grey squirrel. Can hold the weight of up to four cardinals (about 8 oz.). The large tray also collects fallen seed and serves as a platform that allows multiple birds to feed simultaneously from the four seed ports. 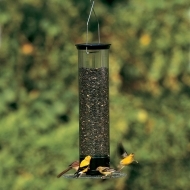 The 4-3/4″ x 17″ clear feeder tube makes the seed visible to the birds, a proven advantage. Made of UV Stabilized Polycarbonate, it ensures long lasting durability without yellowing. Its length and girth are designed to prevent squirrels from reaching the seed ports. the seed visible to the birds, a proven advantage. Made of UV Stabilized Polycarbonate, it ensures long-lasting durability. Its length and girth are designed to prevent squirrels from reaching the seed ports. Keep squirrels away from your bird feeder and save seed! 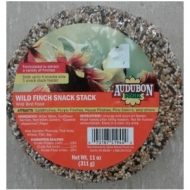 The 5-pound capacity Droll Yankees Yankee Whipper Bird Feeder is a weight sensitive collapsing curved perch feeder that supports birds and not squirrels. 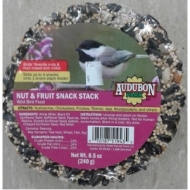 It allows the birds to eat and saves seed by keeping squirrels away. Each perch is individually sprung and calibrated to collapse when approximately 2 oz. or more rests on the perch. Length and girth of the feeder are specific to repelling squirrels. The heavy metal cap is constructed to prevent squirrels from raising the cap and reaching the seed inside. 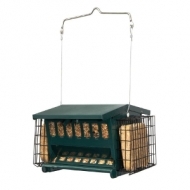 The 5-pound capacity Yankee Flipper Bird Feeder is a motor driven, battery powered, weight activated squirrel-proof feeder. 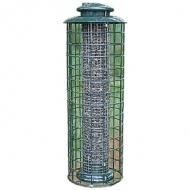 It allows the birds to eat and saves seed by keeping squirrels away. Birds will not set it off, not even larger species like Woodpeckers and Cardinals. But the minute a squirrel hops on to the perch, the motor is triggered and the feeder begins spinning, taking the squirrel for a whirl before it loses its grip and is thrown gently from the perch. The seed tube is generous in height, making it impossible for squirrels to hang down from the top reach seed. The four feeding ports are easily accessible via the perch ring. Sure-Lock™ cap locks the lid in place to keep squirrels out. Four feeding ports allow multiple birds to dine at once. 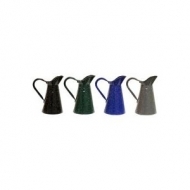 The powder-coated finish offers rust resistance for durability. Wide-mouth opening allows for easy filling and cleaning. Attractive screen-printed design enhances any setting. Holds up to 3 lb of seed. 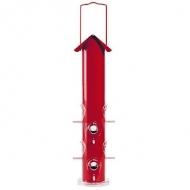 Add some color to your landscape with the Perky-Pet® Red Metal Tube Bird Feeder! 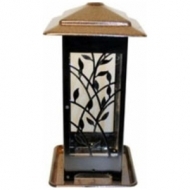 This lovely feeder is a modern addition to your garden, backyard or patio. 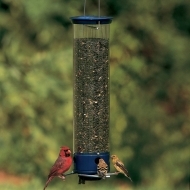 Easily fill the Perky-Pet® Red Metal Tube Bird Feeder with up to 1.5 pounds of seed, place in a quiet and convenient place and watch as a variety of birds flock to your feeder. Features an attractive climbing vine design. Color: Brown. 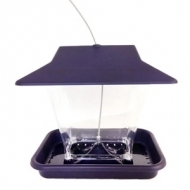 The Stokes Select® MTL Thistle Bird Feeder is making bird feeding easy™ with its SureFill No Spill™ features. Its spring loaded, push button top effortlessly opens with one touch, single-handedly taking away the feeder refill juggling act! 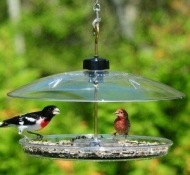 Its newly-designed metal seed tray with wide perch rim helps to keep dropped seeds off the ground and allows larger birds to comfortably feed, while the base is removable for convenient cleaning. With 4 large perches to attract more birds and a 1.2 lb. 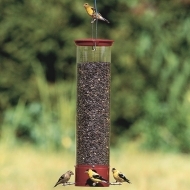 thistle/Nyjer® seed capacity, the Stokes Select® MTL Thistle Bird Feeder keeps hungry birds happy and coming back for more! 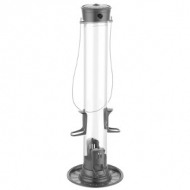 Features one touch opening for easy filling and a removable base for easy cleaning.